Finding Census tract numbers can be difficult and time consuming. Many times, researchers will refer to a Census tract as Census Tract 7 or Census Tract 9.01. But Census Tract 7 or 9.01 doesn't uniquely identify the Census tract; in fact, there are hundreds of Census Tract 7s in the United States. A Census tract is uniquely identified by using its complete 11 digit Census tract number. 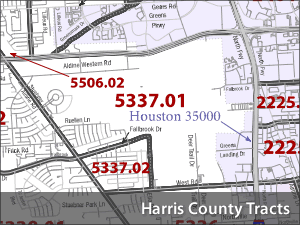 For example, Census Tract 48-201-533701 is located in Harris County, Texas. The 48 is the FIPS code for Texas; the 201 is the FIPS code for Harris County; and the 533701 identifies the specific Census Tract. 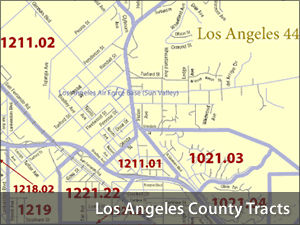 So how can you quickly get the 11 digit identifier for the Census tracts in your area? You've got at least 2 options. If you want to know just the Census tract that surrounds an address, you can use the Census Bureau's address look up tool. It doesn't have every US address so you may have to use Option 1 or Option 2 if this tool tells you that it can't find your address. You can go to the Census Bureau's website and look at their Census Tract maps by county images. As a heads up, some researchers have complained that these images are difficult to use, because it's hard to tell which Census Tracts intersect with their project area.